Your dog's dental health is paramount to his general health. In the wild, an unhealthy mouth normally means certain death – with no ability to eat or hunt, well, you can imagine the fate of the wild dog. Fortunately for our own dogs, if they have an oral health problem, we can help to solve the problem and take preventative measures. There are many different oral health problems that can affect dogs - from broken, chipped or loose teeth right the way through to more serious gum diseases, and everything else in between. This is fortunately a reversible condition where the gums become inflamed and bleed when touched so makes eating, as you can imagine, uncomfortable. 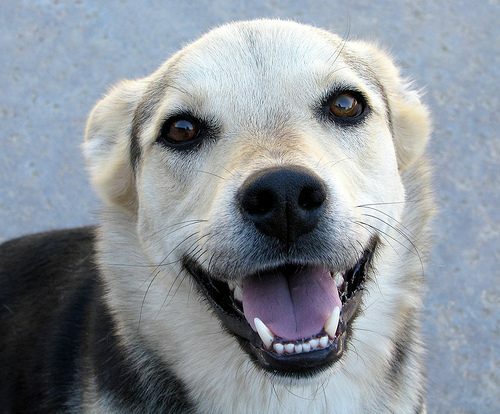 The teeth usually have plaque and some calculus deposits on them and your dog will normally show signs of bad breath. More rare in cats, dental caries is not uncommon in dogs and is mainly caused by the build up of food usually on the grinding surfaces of the molar teeth. A malocclusion is when the teeth are not in the correct position, or if the animal has too many or too few teeth. Another sign can be if the milk teeth remain in the moth at the same time when adult teeth are trying to erupt. It can cause severe discomfort but it is possible to treat some malocclusions with minor surgery or no surgery at all by extraction. Others may need more extensive work but your vet can best advise. The first visible sign that your dog has an oral problem is that he will have trouble or discomfort eating. Other signs included excessive drooling, unusual chewing but most tellingly, offensive breath. Your dog may have naturally unpleasant breath, so look out for any changes to the breath. It may go from the traditional 'meaty' smell, to something more unusual. In this video below experts from Banfield Veterinary Hospital offer advice on how to spot common diseases and problems. Dog owners are fortunate in that they have lots of options, but if your dog has to have treatment to solve the problem at his vets, then it's all but pointless if the treatment doesn't continue at home. Regular oral care is easy and relatively inexpensive. The latest addition to Johnson’s wide range of Pet Healthcare Products is Anti-Plaque dental rinse, suitable for dogs and cats over 12 weeks of age. This product has been formulated to promote and maintain good dental health and used regularly helps to reduce and prevent plaque and the build up of tartar. Also reduces oral bacteria and promotes fresh breath. Anti-Plaque dental rinse is easy to use and is simply added daily to pets water bowl containing sufficient water to be consumed through normal daily intake. “As depressing as it is that an impoverished country such as Mexico has a running joke about our teeth whilst our big cousins in the States encourage their neighbours to giggle behind our backs, that gloom belies the ease with which we can start to put right the years of neglect and mistreatment." Where can we purchase some please.